The RICS website has featured an article from its Modus publication on town centres, by built environment journalist Mark Smulian, that asks if there is ‘any purpose in ‘defending’ something once its economic purpose fades?’. 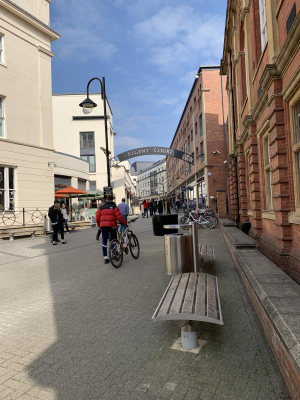 For planners and the property industry, the idea of a town centre no longer being the focus of retail and commercial activity demands some careful reassessment, as does the challenge of sustaining ‘retail-led’ regeneration – a staple of pre-crash urban renewal. It might, for example, involve planning for residential, leisure, education and healthcare where shops once stood, creating a town centre that people still visit but only incidentally for retail. Former Iceland chief executive Bill Grimsey, who has conducted two reviews for the government on the state of the UK high street, says: ‘Plans for town centres have to change. The key is community, not retail, and it’s a broader issue than shops. Forget retail dependency and instead encourage local authorities to plan unique places to live, work, play and shop, prioritising health, education, eating out, leisure and housing. It’s useless to resist [change], as by 2030 about 30% of all shopping will be online. The whole argument that town centres can be fixed with shops is flawed’ he says…. This article originally appeared in The Cash Issue of RICS’ Modus (March 2019), titled ‘Everything Must Go’.